Alone on a small ridge this Ponderosa Pine grew strong and tall despite the wind and snow. A Bull Elk grazes away as we take a quick portrait an leave him to go at it. He never really looked up as eating on this winters day was more important than saying hello to a couple of photographers. He does have his priorities in order. Perched upon a wonderful old tree stump a Red Squirrel sat flaunting it’s gorgeous red tail to the other squirrels nearby. This winter the Red Squirrels seem much more mild mannered than last winters Frenemy. Will it stay that way all winter? I’ll do my part the best I can. But in this case the shelter comes with you. 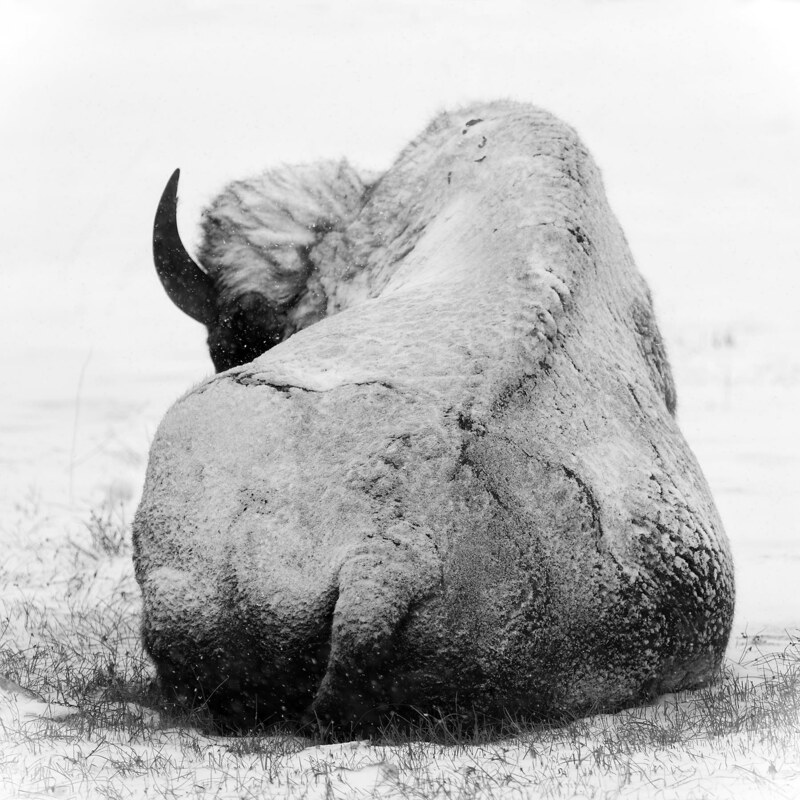 An American Bison, with a wonderfully adapted coat, waiting out a day of snow in Yellowstone National Park this winter. A little drop of color on an otherwise very grey day. Looking out at slices and slices of the diverse landscape in Yellowstone. From big open skies and snow capped mountains framed by hot springs and trees. All littles slices that come together to make this place unique. A fine winter day indeed. Enjoying the beauty of a winters day.